I used a vario centric camber kit. a little more trouble to align, but not as bad as the factory shims, but it does help separate the adjustments,which is the aggravating thing with factory shims. & you could put the slot a tad more outward since you know you need more neg camber. there are similar kits that have more than one set of plates,but I liked this one because it only has the one set & you just turn them different for other adjustments. & someone like Fred could make his own. comethead wrote: Hey Fred I can’t help you on the settings but I’m sure I’ll be there soon enough to ask YOU! I’m thinking of getting that FastTrax alignment tool as well...what do you think of it?? I imagined the fenders would be a problem with the wheel adjustments and any kind of decent tire width. Hey Joe, the Fastrax is real simple and easy to work woth. A set of degree plates would probably be better but there is a angle pointer that is used to figure out how much to turn the wheel in and out. Certainly not the b all to end all but effective. The numbers I'm getting may not work on your car cause of the different things I have done to the spindles and UCA mount. poboyjo65 wrote: I've been cryin for 2 days I'm so jealous of that 7° caster , & green with envy If you had adjustable LCAs you could get that camber back on the neg side pretty quick. that is why I liked the kit from pacific thunder ,which is sold out right now. Yes the lower would make it simple but I'm sure you know that's not my style,, lol. I'll probably shorten the upper for a couple reasons. 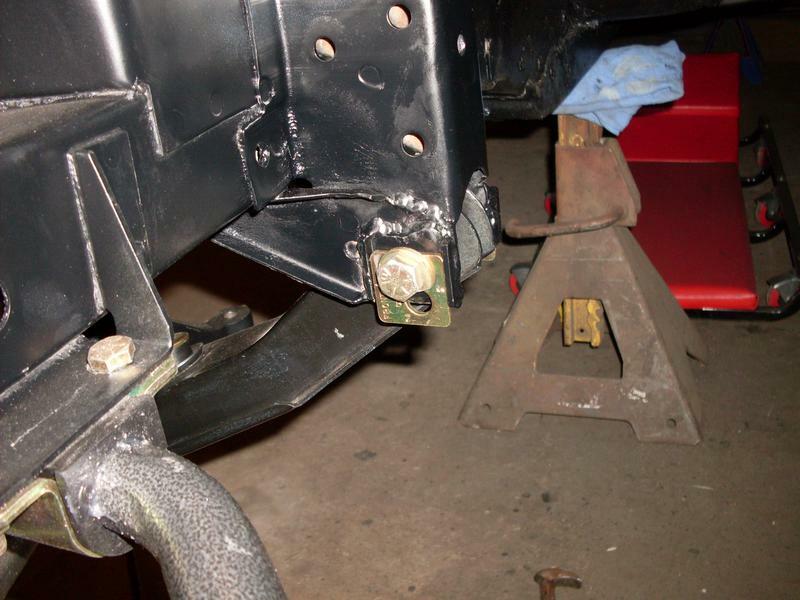 It will quicken the camber gain, stiffen up the spring rate, and create a litlle clearance on the fender. I can still go a couple inches more back space so 7or 8 rims on the front will still work dependant on back spacing. Joe I have the fastrax too & like it pretty good. Fred If you still want to stiffen the spring rate more after you shorten the uppers there is a mod that opentrackr or dazcars tells about to move the spring perches out 1 inch by drilling new holes in the UCAs. suppose to help the geometry too. BTW I thought you had turntables with degrees & arrows on them? & an old school type gauge? Ya the old school wheel alignment equipment was borrowed,,, as is the Fastrax,,, I maintain a good selection of hammers to lend out to help balance out the borrowing. Fred thing about it is it's only drilling 2 holes on each UCA, 4 holes total, so real easy to do if you have it all apart,like you to shorten it,probably up on a workbench already. you can always go back to the old holes if you dont like it. wished I'd known about it before I put mine together, but if I ever go back in I'll do it. poboyjo65 wrote: there is a mod that opentrackr or dazcars tells about to move the spring perches out 1 inch by drilling new holes in the UCAs. suppose to help the geometry too. Johnno...you got a link to either/both of those mods? Here ya go Jim, near the bottom ''one inch spring perch move'' & just below that Fred take a look at the ''ball joint slide'', & ball joint dome mod'' moves the balljoint in & back to improve both camber & caster. might be easier than shortening the arm. all of it is good reading . Joe needs to do some of these nearly free mods to his racecar. 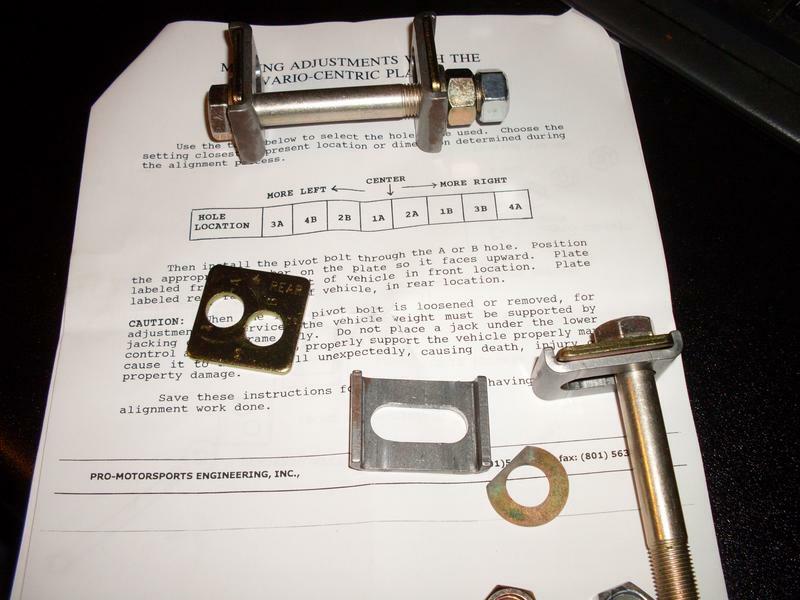 poboyjo65 wrote: Here ya go Jim, near the bottom ''one inch spring perch move'' & just below that Fred take a look at the ''ball joint slide'', & ball joint dome mod'' moves the balljoint in & back to improve both camber & caster. might be easier than shortening the arm. all of it is good reading . Joe needs to do some of these nearly free mods to his racecar. You’re right I need to do some of these free mods. I will more than likely but I’m trying to kick out a basic track car before I get bogged down with a million small details. Once she’s rolling and roaring modifying the UCAs could be a weekend project. First...gotta drink some beers to wrap my mind around this steering/suspension stuff!! More good reading on that link, click on the FAQ. tells how doing all these things helps & why . & doing 4 things will make it drive so much better, larger front swaybar,rollerized idler arm,roller spring perches,& the alignment specs. But one thing they dont say much about is how hard it would be to get those alignment specs with just stock parts, & using only the factory shims to align it. If you separate the adjustments it makes it so much easier to align it & get the specs you want. building in extra caster like Fred did makes it that much easier, you're not fightin for caster. Joe sometimes I forget you already got the frontend stuff on the car. but I gotta pick at you some, for not doing it while it was easy, now you gotta waste a whole weekend on it. But mainly just payback for all the pickin you gave me. Yea i wish I'd seen the balljoint slide,why didnt you tell me about that?? had thought about doing it but figured the dome wouldn't allow it to move & I'd have to alter all of that. but if it is just drilling new holes & welding up the old ones that would be easy, & you'd get a big hunk of + caster which is hard to get with stock parts. Hey Joe, here's a series of videos to help you wrap your head around suspension for a track attack car. He uses a newer car but the principles are the same. I have watched these several times and get a little more each time. Thanks Fred and Johnnie! That’s lots of good info. I didn’t realize Opentracker modded UCAs to that degree. Very cool for those that want to stay within the vintage stock rules. Thanks again guys I have a lot to digest. And I’ll probably be getting the Fastrax deal to get my alignment done. Yea thanks Fred for that link. poboyjo65 wrote: More good reading on that link, click on the FAQ. tells how doing all these things helps & why . & doing 4 things will make it drive so much better, larger front swaybar,rollerized idler arm,roller spring perches,& the alignment specs. But one thing they dont say much about is how hard it would be to get those alignment specs with just stock parts, & using only the factory shims to align it. If you separate the adjustments it makes it so much easier to align it & get the specs you want. building in extra caster like Fred did makes it that much easier, you're not fightin for caster. Man I remember back when you were armor (wait it’s Fred’s thread)...armour plating your Comet and I was driving mine! Well I've gotten a little farther on the front suspension. The uppers are done, I moved the upper balljoint in 5/16inch to get the negative camber back i lost increasing the caster. Moved the upper instead of the lower out for fender clearance. Also notices the spring perches were wearing into the UCA so I reinforced the area with a bit of 1/8 plate. Waiting for the new balljoints and it'll be time to finish up. One really interesting thing, the 1inch out of the spindle tierod arm took almost 2 turns out of the lock to lock. Started at over 5 now 3 1/2-3/4! The Shelby Quick steer kit will probably get me down to 3 or so and with the caster increase the EPS will actually be needed. I'll have to keep the caster down to 6-7 degrees positive cause after that the bumpsteer starts again and at around 6 virtually 0 bump steer. also gonna put a little more negative static camber than most at about 1-1 1/2. All this could change but I'm gonna start there. I took a pic of the old balljoint cause it says "Made in the US" instead of USA, thought that was different.